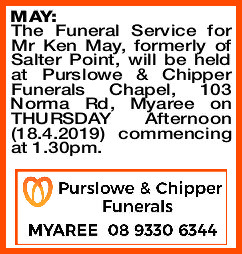 The Funeral Service for Mr Ken May, formerly of Salter Point, will be held at Purslowe & Chipper Funerals Chapel, 103 Norma Rd, Myaree on THURSDAY Afternoon (18.4.2019) commencing at 1.30pm. 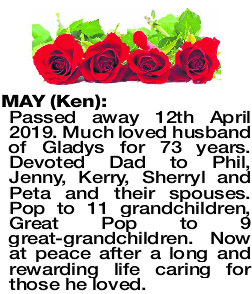 MAY KEN Passed away 12th April 2019. 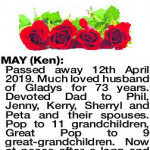 Much loved husband of Gladys for 73 years. 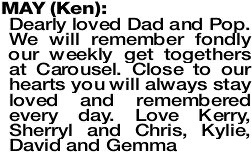 Devoted Dad to Phil, Jenny, Kerry, Sherryl and Peta and their spouses. Pop to 11 grandchildren, Great Pop to 9 great-grandchildren. Now at peace after a long and rewarding life caring for those he loved. MAY KEN Ken you were my rock, my core and my whole reason for being. Our love was deep and enduring for over 73 years and for that I will be forever grateful. I am devastated at losing you. 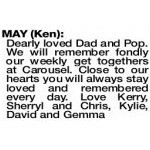 Until we meet again Kenny, my love, Amore, Amore. Your loving wife Gladys. 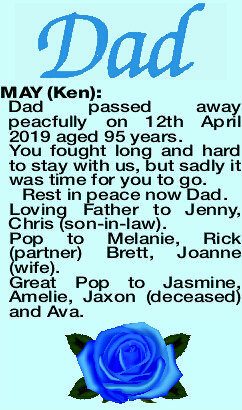 MAY KEN Dad, Pop, Great Pop we will miss you greatly and remember you fondly. You set many fine examples for us all that we will struggle to emulate, but we are inspired by you to make the attempt. Rest in peace now. Phil, Sue, Belinda, Dylan, Jacob, Keira, Clint, Bethany and Henry Kenneth May. 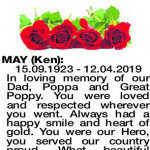 MAY KEN Dad passed away peacfully on 12th April 2019 aged 95 years. You fought long and hard to stay with us, but sadly it was time for you to go. 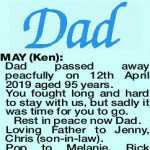 Rest in peace now Dad. Loving Father to Jenny, Chris (son-in-law). Pop to Melanie, Rick (partner) Brett, Joanne (wife). Great Pop to Jasmine, Amelie, Jaxon (deceased) and Ava. 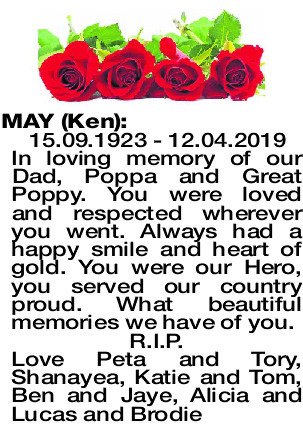 MAY KEN 15.09.1923 - 12.04.2019 In loving memory of our Dad, Poppa and Great Poppy. You were loved and respected wherever you went. Always had a happy smile and heart of gold. You were our Hero, you served our country proud. What beautiful memories we have of you. 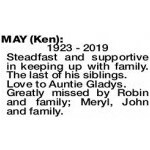 MAY KEN 1923 - 2019 Steadfast and supportive in keeping up with family. The last of his siblings. Greatly missed by Robin and family; Meryl, John and family. 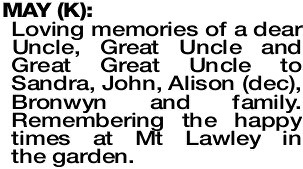 Loving memories of a dear Uncle, Great Uncle and Great Great Uncle to Sandra, John, Alison (dec), Bronwyn and family. 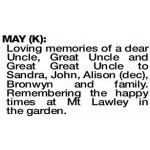 Remembering the happy times at Mt Lawley in the garden. Deepest sympathy to Gladys and Family on the passing of our esteemed Member R.W.Bro. Ken May PJGW. He will be sadly missed. Rest in Peace. The Worshipful Master and Brethren of the Lodge of Unity No. 11 WAC.